The star of Bethlehem? An Edison mystery in Hunterdon. Once again, it was proven to us: travel around North Jersey and you're bound to find something related to Thomas Edison. This time, it came when we made a left turn off Route 57 West, passing Earle Eckel's Autogiro Port on our way southward to points unknown. After an enlightening stop in Asbury (more to come on that soon), we found ourselves driving on an undulating road through beautiful farmland. We weren't quite sure where we were, except that we'd left Warren County. And then, there it was: a Hunterdon County historic marker. Titled "TOWER HILL FARM," it continued, "Dating back to the 1840s, this farm was purchased for Thomas Edison's storekeeper, Frederick Devonald, in 1932 and remained in the family until 1983. Unusual springhouse consists of two levels." Devonald was a name I hadn't come across in my reading on Edison's life and career, leading me to believe that he wasn't one of the Muckers, the tight-knit group who worked closely with the Old Man on his experiments. He's not referenced in two of the latest and most comprehensive Edison biographies, nor does Mucker Francis Jehl mention him in his Menlo Park Reminiscences. Who was this mystery man? Considering that Edison's Stewartsville Portland cement plant is a 12 mile drive away from Tower Hill, I wondered if he'd been one of the many employees who'd never worked in either Menlo Park or West Orange. And who had purchased the land for Devonald a year after Edison's death? Was the gift connected to his work service at all, or was I just reading too much into a sign author's attempt at economical writing? Back at Hidden New Jersey HQ, we set ourselves to finding out. 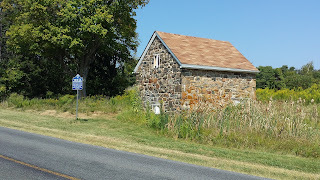 Checking first with Hunterdon County Parks and Recreation, we discovered that in addition to the stone springhouse we'd seen, the property hosted a farmhouse that had been built in 1848. Interestingly, the Parks and Rec website said that other Devonalds than Fred -- Ira and Margaret -- bought the farm in 1932 as a family weekend retreat, with three of them eventually making it their full time home. Records of the 1920 census list Ira and Margaret as two of the eight children being raised by Fred and his wife Julia in Orange. There went my supposition that Edison had bought the property for Devonald, but what about Fred's job? His family being from Orange made it doubtful that he worked at the Stewartsville cement plant. Was he, in fact, one of the keepers of the famous storeroom in the Building 5 machine shop at the West Orange lab? The wondrous room that Edison famously claimed to have everything from the hide of a rhinoceros to the eye of a United States Senator, all in order to speed the process of invention? As it turns out, it's entirely possible. A search of the online archives of Rutgers' Thomas Edison Papers project reveals more than 70 documents referencing or signed by Devonald, mostly related to the procurement of supplies for the storeroom. One even went directly to Edison at his Ogdensburg iron mines, asking for approval to purchase chemicals. (Edison asked for prices and said he'd see Devonald to discuss.) Another source noted that Fred once turned to Julia, herself an Edison employee, to make a motion picture screen. And that leads us to Fred's brief star turn. While not a key employee, he was accorded a role in the development of one of Edison's most noteworthy inventions -- literally. A small room on the second floor of the West Orange labs was, in effect, the world's first motion picture studio, and the Edison movie making team needed animated subjects to test the kinetoscope technology. Hams like Mucker Fred Ott were more than happy to fake a sneeze for the cameras, and it seems that Devonald was open to participating, too. You have to wonder if he's one of the men in the brief dance scene in this film. We may never know which one of the subjects he was, and he certainly didn't go on to screen stardom. But it does go to show: in the right work environment, you can have a lot of fun if you show a little personality.